This is awesome Kathy!! All I can say to this is "Amen." 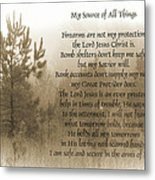 My Source of All Things - by Kathy Clark Firearms are not my protection, the Lord Jesus Christ is. 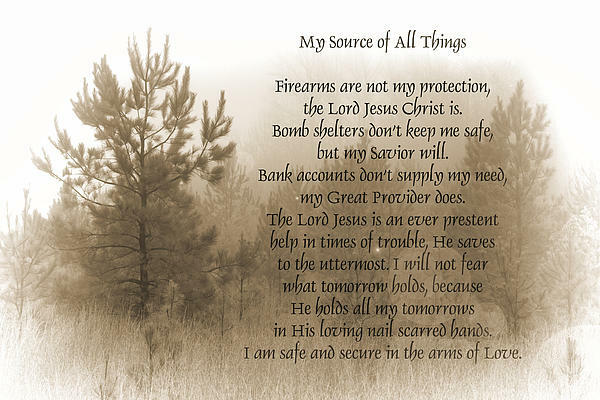 Bomb shelters don't keep me safe, but my Savior will, Bank accounts don't supply my need, my Great Provider does. 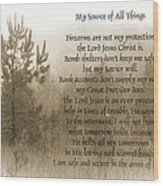 The Lord Jesus is an ever present help in times of trouble, He saves to the uttermost. 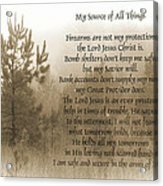 I will not fear what tomorrow holds, because He holds all my tomorrows in His loving nail scarred hands. I am safe and secure in the arms of Love.